BEIJING, -- The People's Liberation Army is hoping that its new JH-7A "Flying Leopard" fighter-bomber can help give China a much-needed boost in aerial electronic warfare, reports the Beijing-based Sina Military Network. The JH-7A is an upgraded version of the JH-7 twin-engine fourth generation aircraft manufactured by the Xi'an Aircraft Industry Corporation. The fighter-bomber is said to be a major step forward in China's bid for "electromagnetic supremacy," the modern key to air supremacy in combat. According to the report, the current problem with China's electronic warfare lies in the low number of available platforms, inferior technology and average combat capabilities. At present, the PLA only has two aircraft with electronic warfare and countermeasure capabilities — the HD-6, the electronic warfare variant of the H-6 jet bomber, and the Y-8G, the electronic warfare model of the Y-8 transport aircraft. Neither is particularly suitable for combat, however, as the HD-6 is hampered by its heavyweight, high fuel consumption and short flight endurance, while the Y-8G is considered slow and with poor defensive capabilities. The JH-7A is believed to be exactly what China needs, a durable aircraft that can engage in electronic warfare and be able to withstand electromagnetic attacks, the report said. Importantly, the fighter-bomber's load capacity is reportedly sufficient to carry the higher weight of Chinese electronic warfare equipment, which is said to be on average heavier than that of the US. Nonetheless, Chinese technology has not yet reached the level of the US military's ALQ-99 and ALQ-218 airborne electronic warfare systems, which are capable of receiving and jamming signals through the same aperture, said the report. Accordingly, the JH-7A requires more antennas to be mounted, though this also raises concerns that it could interfere with the PLA's own communications and signals. In addition to electronic warfare installations, the JH-7A can also carry combat weapons such as anti-radiation missiles and medium-range air-to-air missiles combination, the report said. It is the PLA's hope that by combining state-of-the-art electronic warfare equipment with lethal firepower, the JH-7A could end up as effective as the EA-18G Growler, America's carrier-based electronic warfare aircraft that once shot down an F-22A fighter in a training exercise, the report added. 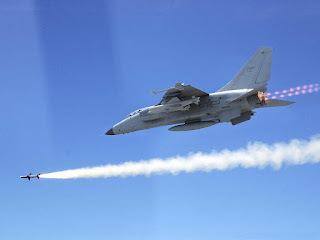 The JH-7A's flight range and speed are also suitable for combat, the report said, adding that with a combat radius of 1,350 kilometers and speeds of up to Mach 0.8, the aircraft will be able to participate in missions with fighter jets like the J-10 and J-11. It is also expected that the JH-7A will add some stealth capabilities to make the plane more difficult to detect by radar. The People's Liberation Army Air Force JH-7A Flying Leopard twin-engine fighter-bomber fires advanced missile.